Marseille went back up to second place in Ligue 1 when a penalty from France international Andre-Pierre Gignac gave them a 1-0 win over Evian. 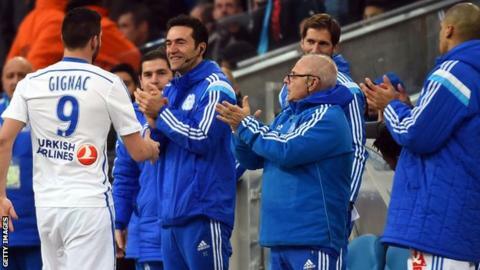 Gignac's second-half spot-kick, after Dimitri Payet was fouled by Cedric Barbosa, was enough to give Marseille an 11th successive home league win. Payet volleyed against the bar and Alaixys Romao shot over late on as the hosts went close to adding a second. Marseille are now one point behind Lyon, who go to Monaco on Sunday. Match ends, Marseille 1, Evian Thonon Gaillard 0. Second Half ends, Marseille 1, Evian Thonon Gaillard 0. Hand ball by Nicki Bille Nielsen (Evian Thonon Gaillard). Alioune Fall (Evian Thonon Gaillard) is shown the yellow card for a bad foul. Offside, Marseille. Billel Omrani tries a through ball, but Michy Batshuayi is caught offside. Attempt missed. Daniel Wass (Evian Thonon Gaillard) right footed shot from outside the box misses to the right from a direct free kick. Daniel Wass (Evian Thonon Gaillard) wins a free kick in the attacking half. Foul by Jérémy Morel (Marseille). Djakaridja Koné (Evian Thonon Gaillard) wins a free kick in the attacking half. Fabien Camus (Evian Thonon Gaillard) wins a free kick on the left wing. Attempt missed. André-Pierre Gignac (Marseille) right footed shot from the centre of the box is high and wide to the right. Assisted by Dimitri Payet with a cross following a fast break. Substitution, Marseille. Baptiste Aloe replaces Benjamin Mendy. Offside, Marseille. Giannelli Imbula tries a through ball, but Brice Dja Djédjé is caught offside. Attempt missed. Giannelli Imbula (Marseille) left footed shot from outside the box misses to the left. Assisted by Brice Dja Djédjé. Attempt missed. Jacques-Alaixys Romao (Marseille) left footed shot from the centre of the box is too high. Assisted by Giannelli Imbula following a set piece situation. Jacques-Alaixys Romao (Marseille) wins a free kick on the right wing. Foul by Djakaridja Koné (Evian Thonon Gaillard). Foul by Daniel Wass (Evian Thonon Gaillard). Substitution, Evian Thonon Gaillard. Fabien Camus replaces David Ramírez. Djakaridja Koné (Evian Thonon Gaillard) wins a free kick on the right wing. Hand ball by Giannelli Imbula (Marseille). Nicki Bille Nielsen (Evian Thonon Gaillard) wins a free kick in the defensive half. Dany Nounkeu (Evian Thonon Gaillard) wins a free kick in the defensive half. Benjamin Mendy (Marseille) wins a free kick in the defensive half. Foul by Nicki Bille Nielsen (Evian Thonon Gaillard). Youssouf Sabaly (Evian Thonon Gaillard) wins a free kick on the left wing. Substitution, Evian Thonon Gaillard. Nicki Bille Nielsen replaces Nicolas Benezet. Offside, Marseille. Rod Fanni tries a through ball, but André-Pierre Gignac is caught offside. Jacques-Alaixys Romao (Marseille) wins a free kick in the defensive half.